Wickremesinghe in Delhi; long dormant agreement to develop Sri Lanka’s Trincomalee Oil Tank Farm likely to be revived today. When the visiting Sri Lankan Prime Minister Ranil Wickremesinghe meets Prime Minister Narendra Modi for a working lunch on Wednesday, an agreement for the development of the Trincomalee Oil Tank Farm will be the hottest dish on the table. Sri Lankan and Indian government sources said the two sides will finalise an MoU for a joint venture to develop the 99-tank storage facility, which is an extension of Trincomalee Port, ahead of Modi’s visit to Sri Lanka for the United Nations Vesak Day celebrations in the second week of May. In Sri Lanka, news of the impending deal triggered a strike Monday by unions of the Ceylon Petroleum Corporation (CPC) to protest “the handing over of a national asset” to India. The strike created panic and chaos at petrol pumps, and massive traffic jams in Colombo. The strike was called off after a few hours following negotiations between the unions and Wickremesinghe, who assured the protesters they would be consulted before the deal was finalised. Sri Lanka Public Enterprise Development Minister Kabir Hashim has assured that the government has no plans to hand over Trincomalee harbour or the oil tank farm to India, and that it would be a joint venture between the two governments. The agreement is being seen as Sri Lanka’s balancer with India, an apparent compensation for China’s involvement in a slew of projects in that country — after building a new port in Hambantota, the Chinese are now modernising Colombo port, and building an offshore “port city”. 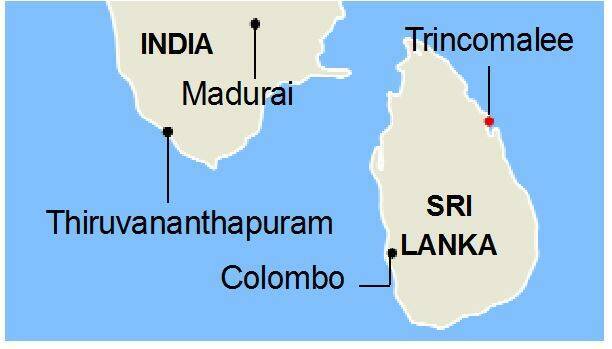 Ironically enough, Trincomalee’s natural harbour, where the oil farm is located, is called China Bay. In truth, India had this deal 15 years ago, much before the Chinese got the Hambantota project. How the agreement lay dormant all these years is a story of Sri Lankan second thoughts, Indian diplomatic inertia, a disinterested oil PSU that saw its role in purely commercial rather than strategic terms, a brutal civil war, and indifferent relations. The MoU, when it is signed, will mark a milestone in a long saga that began with the 1987 India-Sri Lanka Accord. In 2003, Indian Oil Corporation set up a Sri Lanka subsidiary called Lanka IOC, which, under an agreement with the Sri Lankan government and CPC, obtained a 35-year lease to develop the 850-acre tank farm, a facility with 99 storage tanks built by the British before World War II. LIOC paid $ 100,000 annually to the Sri Lankan government for the lease, but did nothing with the property. With the war in Sri Lanka still on, investing in Trincomalee was seen as unviable. Sri Lanka, on its part, was relieved to have an Indian facility in the East as an insurance against the LTTE, but even so, the government kept finding ways to put off formalising the agreement — even though this was required to be done within 6 months. After 2005, when Mahinda Rajapaksa became President, formalisation became impossible. For India, the only saviour was the absence of a termination clause in the 2003 agreement. Despite India’s cold relations with Rajapaksa, proposals for developing a refinery and oil storage facility emerged every now and then. But IOC was not interested. And if Delhi saw potential in Trincomalee as a strategic counterweight to Hambantota, it did not seem to have the diplomatic energy to push it. Rajapaksa’s defeat at the hands of party rival Maithripala Sirisena in the January 2015 presidential election, and the election of a new government with Wickremesinghe as Prime Minister in 2015, brought a visible thaw in India-Sri Lanka relations. But the Trincomalee oil tank farm remained a fraught issue. In March 2015, when Prime Minister Modi visited Sri Lanka, it was announced that the governments had agreed to set up a petroleum hub in Trincomalee, for which a “Joint Task Force” would draw up plans. But nothing moved. In December 2016, there was high drama at the tank farm — a CPC team which wanted to enter the facility alleged it had been “detained” by LIOC staff. The incident led to the resignation of the then CPC chairman. The CPC filed an FIR against LIOC officials, and the matter is in court. The facility is divided into an 800-acre Upper Tank Farm (UTF), which has 84 tanks, and a 50-acre Lower Tank Farm (LTF), with 15 tanks. Through the 13 years that it has been with LIOC, the UTF has remained in the same condition in which LIOC inherited it — unused since the 1940s, decrepit and overrun by vegetation. The tanks are unusable; one tank, damaged during the War by a Japanese kamikaze pilot, is beyond repair. LIOC carried out some renovation work in the LTF where it has set up a lubricant blending plant, importing the oils from India and Southeast Asia. The material lands at Trincomalee port, and is transported to the LTF through an oil jetty at the port. That India and Sri Lanka have to make a new joint venture to implement an old agreement tells of the eggshells they must walk on. Minister Hashim has been at pains to underline that while the earlier agreement gave CPC no tanks, the new one will give it 10; India will get 14; and the remaining 74 will be developed jointly. It is another matter that CPC, which has not made profits for the last many years, may not have the resources for even joint development. The heavy lifting will have to be done by the LIOC, backed by the Indian government. Hashim has also stressed that it is not India, but Japan — Sri Lanka’s biggest donor in the war years — that the country is talking to for the development of Trincomalee Port. That, given India’s new strategic alliances, should be no skin off New Delhi’s nose. India does not have the deep pockets that building a port would need. Even for Jaffna’s Kankesanthurai port project, India has been in discussions only since 2011. But Indian officials are clearly looking at other infrastructure development spin-offs from the Oil Tank Farm development deal — roads, railways and energy projects in Trincomalee. 1 Use of beacons: Where do the red lines lie?